Good ventilation is essential in all buildings, not only to remove unwanted odours, but more importantly to prevent the build up of warm moist air that can lead to condensation, mould growth and rotting of timbers. Damp is one of the most dangerous enemies in any building but can be overcome by sealing the building to keep the water out. Pockets of moisture laden air are inevitably created inside the building as a result of cooking, running hot taps and even the inhabitants breathing. If the moisture becomes trapped mould will flourish and rot will take hold, possibly wrecking the structural timbers in the long term. The most vulnerable parts of the building are the void below the suspended timber ground floor area. 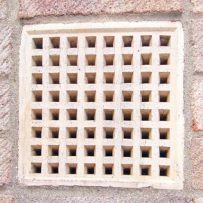 Under-floor ventilation such as airbricks must be fitted at 1.8m intervals around the bottom and above the sub-floor 150 mm ground level. Remember, if an airbrick becomes blocked or broken it should be fixed immediately. An airbrick only costs a few pounds to replace and compared to the cost of replacing the floor joists it would be madness not to fix this potential timebomb.